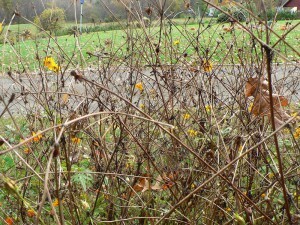 The fiber and dye plants at my plot at Bramble Hill have done a brilliant job of setting seed this fall. It’s very exciting. Since it is nearly All Hallows Eve, or Samhain, or El Dia de los Muertos, depending on your tradition, I have been thinking a lot about the relationship between the dead and the living. Harvest and abundance, frosts and death. Seeds carry us through from one season to the next, from the death of fall to the life of spring. Orange cosmos are usually prolific, but this year seemed especially so. Here are some images of the cosmos plants back on October 19th when I harvested the Japanese indigo. A chaotic tangle of flowers, stalks, and seeds. Death and rebirth. Why two blog posts in one night, you may wonder? I am typically a binge-blogger. Once I finally sit down to deal with photos and organization and writing, I get in a groove and it’s fun to keep going. Tonight, however, I am killing time while I wait up for a tansy dye bath and a wool mordanting bath to get done. Tomorrow I am doing a natural dye workshop for Mass Ag. in the Classroom at their day of hands-on gardening skills. I have been absurdly busy with one thing and another all week, so tonight was my sole free night to wind skeins, scour, mordant, and make the dyebath. It’s more than I usually try to do in a night after work, and makes for a later night than usual. Anyway. I am not actually writing about that. I am writing about my gorgeous Japanese Indigo plants. Way back on October 5th, a Sunday, we had a frost warning. I had a shift at the Shelburne Arts Co-op that day, so my time for gardening was limited. In the morning I went over to the garden at Bramble Hill to assess the situation and do triage. I decided to go back to the garden after my shift to cover the Japanese indigo plants because I was hoping to nurse them along for a while to let the seed mature. More on that later.